The Tetherless World Constellation (TWC) at Rensselaer Polytechnic Institute (RPI) is a constellation of multidisciplinary researchers who study the scientific and engineering principles that underlie the Web, to enhance the Web's reach beyond the desktop and laptop computer, and develops new technologies and languages that expand the capabilities of the Web under three themes: Future Web, Xinformatics and Semantic Foundations. 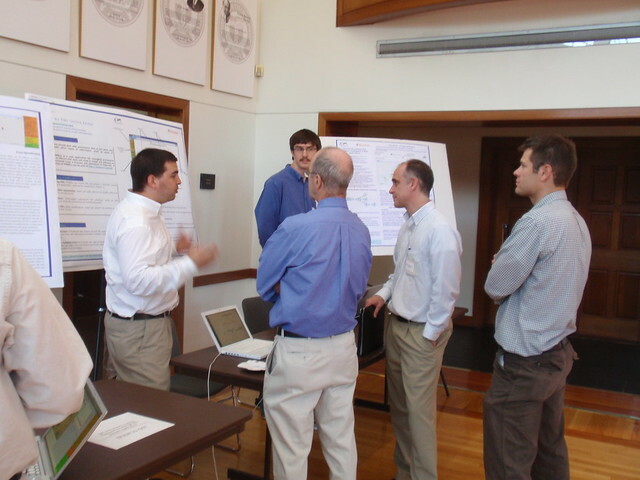 Tim Berners-Lee (center) congratulates TWC PhD recipients Greg Williams (left) and Jesse Weaver (right) during a March 2013 visit. TWC's Peter Fox (center) receives the 2012 EGU Ian McHarg Medal for significant contributions to Earth and Space Science Informatics. Presented by David Arctur (OGC) and Mohan Ramamurthy (Unidata) at EGU 2012. TWC students Jesse Weaver and Greg Williams accept award for winning Billion Triple Challenge at ISWC 2009. Stephan Zednik presenting at Tetherless World Grand Opening to Professor Deborah L. McGuinness, Sir Timothy Berners-Lee, and RPI President Dr. Shirley Ann Jackson.